As my 1290 spends 90% of its time on track I had to come up with a exhuast solution that will pass 102db at 5.5k rpm static. Can't afford to throw £2.2k at the full Akra. 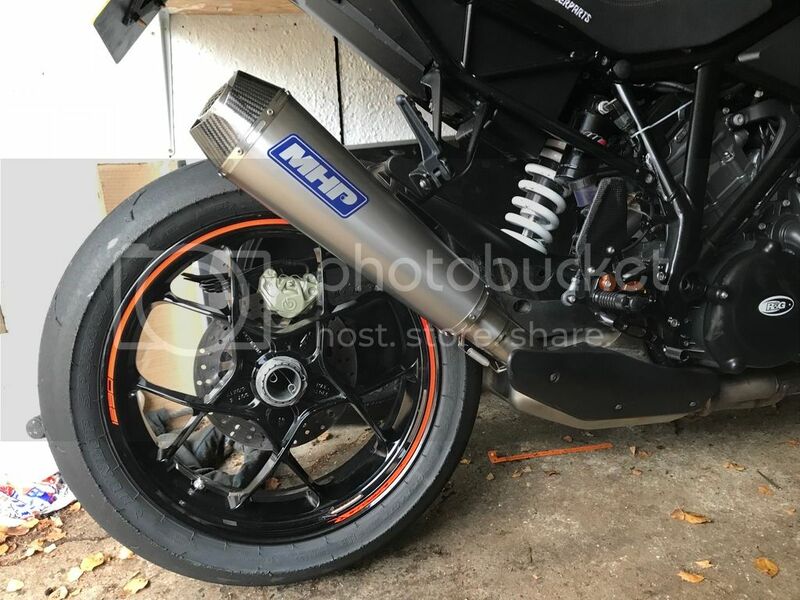 I spoke to a mate, Marcus Hill of MHP Racing Exhausts. He said de-cat of the OEM box, new link and one of his Evo cans would keep me under that db and I wouldn't lose torque by losing the resonator box. A mate gave me a 2016 box off his bike as he has the full system. He opened up the box, stripped out the cat only. All the pipework in there is actually quite good. All the smaller diameter pipes add up to the 60mm exit so gas flow wouldn't be a problem. He then fabricated a new 60mm exit pipe that will take any 60mm can with spring clips. Got it all on the bike and it noise tested exactly 100db with the mesh cover he uses to break up the sound. Looks like a spark arrestor but does a really good job with sound too. 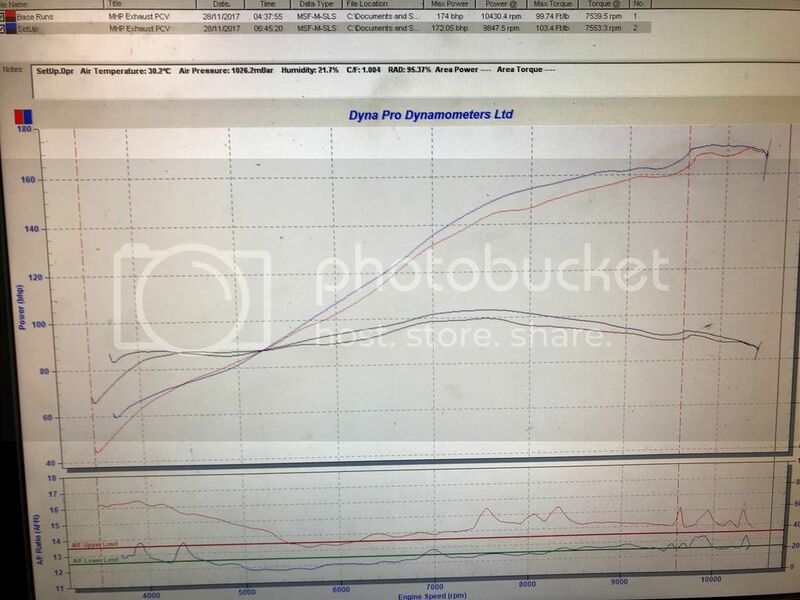 Took the bike to be tuned at Track Electronics on Wednesday and John managed to get 172bhp and 103.4ftlbs He normally enjoys tuning bikes but the 1290 fought him all the way. There is a big dip near the top which he says is engine electronics. Couldn't do anything to get rid of it. If he had full access to the ECU like with TuneECU or Woolich he could get even more out of it. Fingers crossed TuneECU get there or Woolich get around the KTM ECU at some point soon. Off to Snetterton in the morning to test it on track. Should be a load more grunt throughout the range. 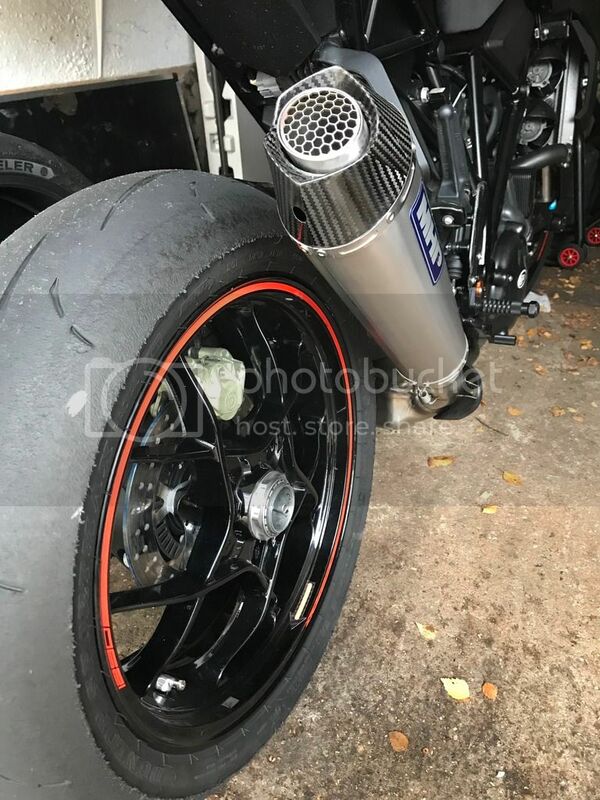 Good looking exhaust can Klinck! nampus wrote: Good looking exhaust can Klinck! Any chance of a little video for the sound? It is back at the dealers again at the moment with the air in the clutch when spanking it issue. They have already changed the master cylinder, even though I know it isn't that. It is the slave and I'm hoping KTM just take the hit and fit an Oberon as the OEM one isn't fit for purpose. When I get it back I'll do a vid.